Green papaya ribbons tossed with a bright Asian-inspired herb, lime, and lemongrass dressing make a unique and healthy vegetarian meal. I’ve been dreaming of making a green papaya salad for a while now… I just don’t see them (the unripe not-sweet green kind) around too often. A few weekends ago Jack and I ventured out to the MT Supermarket, a ridiculously huge asian market that we’d somehow never been to. If you live here in Austin, have you been there? The only way I can describe it is that it’s maybe the Asian grocery equivalent to IKEA. Super overwhelming… fun but probably only because it was our first time… and make sure you are highly caffeinated before you go. Among other treasures, I came home with a green papaya. Using a julienne peeler, (I know another gadget – sorry! 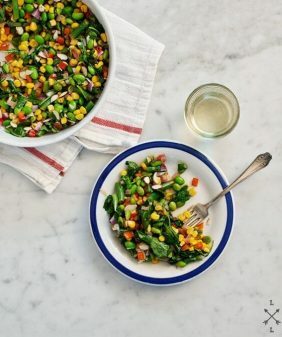 ), I sliced thin uniform strips of papaya and tossed them with some chopped veggies and a light dressing made up of scallions, herbs, lemongrass, a big splash of coconut milk, and a few squeezes of lime. If you’re serving this as a side dish, feel free to stop there. Since this was our dinner on this particular night, I made it a more complete and filling meal by tossing some shrimp on top… some baked or grilled tofu would also be delicious. *I used a julienne peeler to make these nice even papaya strips. (I also tried using the zucchini noodle maker). The julienne peeler took me a few frustrating minutes to get the hang of… after that it was pretty easy. It would have been more painstaking to slice them with a knife and they wouldn’t be as noodle-like. Having nice thin, even strips is kind of key here. 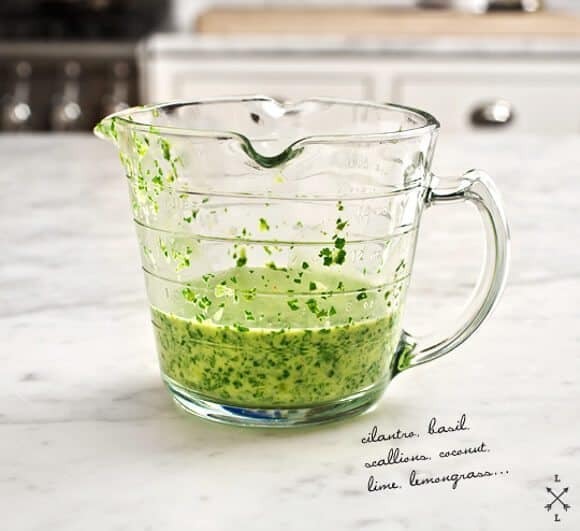 Make the dressing: Pulse the scallion, sesame oil, lemongrass, cilantro, basil, garlic, soy sauce, coconut milk, agave, sriracha, and lime juice and zest in a food processor until combined but not pureed, so you can see course flecks of herbs. Taste and adjust seasonings. 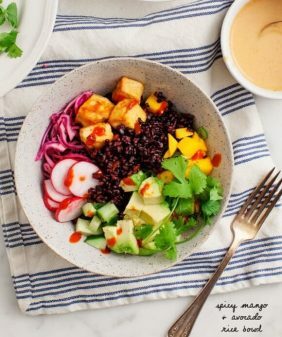 Assemble the salad with the papaya, bell pepper, and scallion and toss with as much or as little dressing as you like. Top with a protein, if using, and garnish with the chopped herbs and peanuts. *If you don’t have lemongrass, just taste and add extra lime zest if you wish. 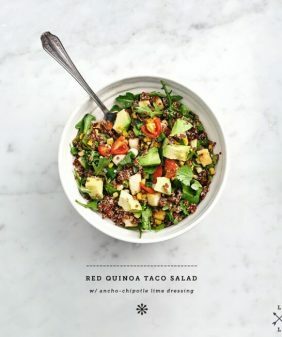 Looks fresh and lovely, and the dressing sounds so herbaceous and fragrant. I like the Asian-inspired touches. This has been my favorite dish this summer, but I never really knew how to make it. This was mostly because I had trouble finding green papayas, but not I at least have the recipe! 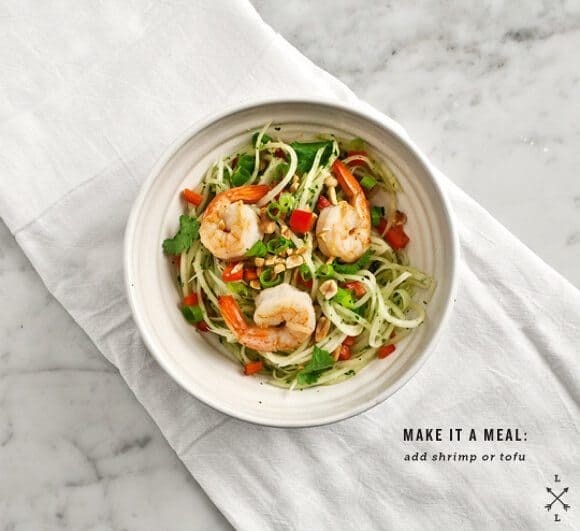 I am a sucker for all things Thai, especially the green papaya salad. What a lovely thing. Wow – this looks awesome. We’ll have to try. Also, am ordering a julienne peeler right now! 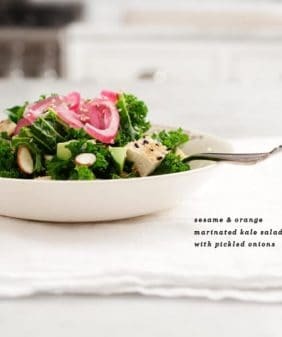 What a lovely fresh sounding salad, I will be on the look out for green papayas! 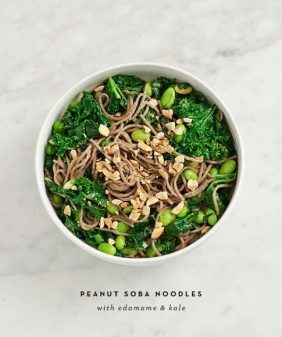 Oh this looks so delicious! My parents grow a papaya tree in our backyard and we make this for dinner all the time! I’d love to try your recipe, the coconut milk and agave syrup sounds like a great twist to our normal Lao style papaya salad. 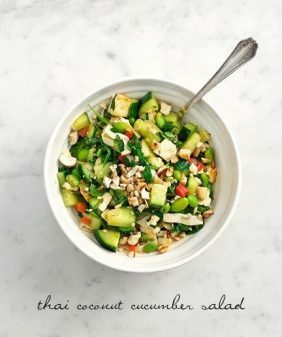 I adore any Thai recipe that I can get my hands on and Thai salads are just the best! Thanks for sharing this recipe! Maybe it’s because I live in Thailand, but I consider a julienne peeler to be a kitchen neccesity. 😉 Beautiful recipe, and I’m so glad to know it’s possible to get your hands on green papaya back in the US! I tried papaya salad for the first time in Thaïland and I was really delicious… and very spicy ! I had one recently in Switerland, completely different and not so good… I really like the idea of the shrimps in it, it’s very colourful and looks great ! Thanks for the recipe ! I love, LOVE green papaya salad. 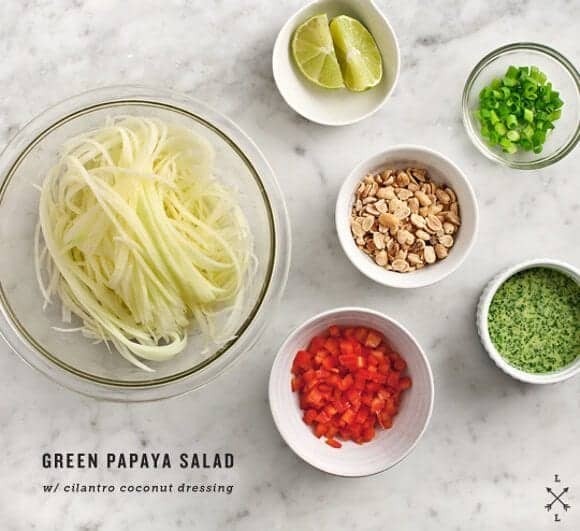 Your coconut milk dressing sounds perfect with al the lime and lemongrass. We have a totally overwhelmingly large and chaotic Asian supermarket in Toronto too. They have everything there, it’s such an adventure to go. Papayas remind me of a trip to Indonesia. I ate them all the time, just like pineapples. I’m not sure where I can find them in my town, but your recipes makes it worth the search. There’s an Asian food store so perhaps I will be lucky there!